During its E3 conference last night, Bethesda Game Studios revealed that a new game in the Elder Scrolls series is coming to iOS and Android devices this fall, called The Elder Scrolls: Blades [Direct Link] (via TouchArcade). Bethesda describes Blades as a free-to-play title, but the developer didn't give any further details about potential in-app purchases. ...beautifully rendered, console-quality environments, powerful magic, tons of gear to collect, upgradeable skills and of course, real-time fantasy battles! The single-player campaign takes players through the town rebuilding process, where they will be able to customize the city to their liking as it expands and even visit their friends' towns. In every mode, Blades supports both two-handed landscape and a one-handed portrait setup, and to switch between each all you have to do is rotate the iPhone or iPad. 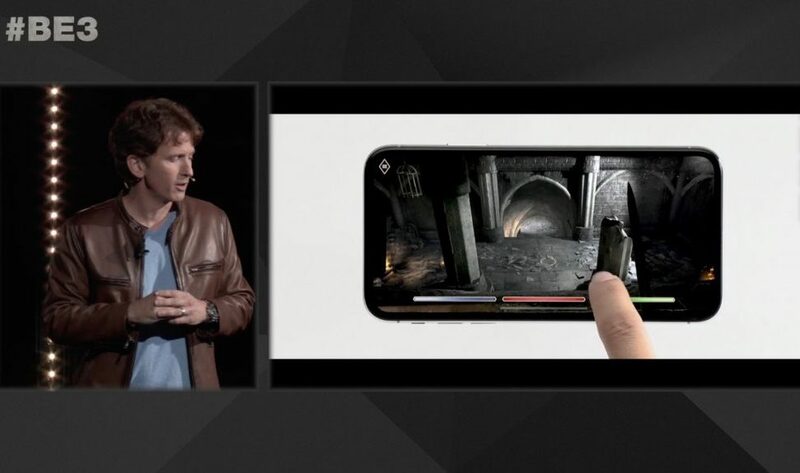 During the company's press conference, Bethesda Games Studios director Todd Howard showed a video of the game running on an iPhone X. Those interested have until June 15 to pre-register for a chance to be part of the game's early access program. Otherwise, Bethesda says that The Elder Scrolls: Blades will launch to the public sometime later this year. Although it's launching first on smartphones and tablets, Howard says that Blades will eventually be available on PC and console.